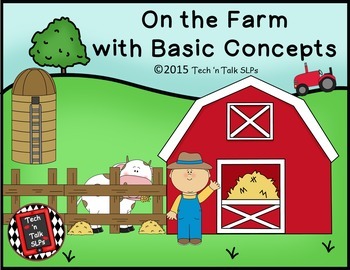 On the Farm with Basic Concepts is a general language development packet with a farm theme. Included are activities for receptive and expressive vocabulary and concepts including inferences, same/different, spatial relations, temporal relations, opposites, colors, and shapes. This packet includes four token boards designed for use with a magnetic wand and chips. The token boards were designed to be used with the following vocabulary/language building activities. (They can also be used as token boards with any other activity). •	Activity 1 – Have the students find the items as you name them. •	Activity 2 - Have the students name the items. •	Activity 3 – Use the included Farm Inferences sheet and have the students find the item described. 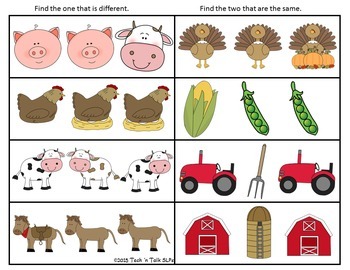 •	Same / Different – Use this worksheet to have the students show which animals are the same and which are different. 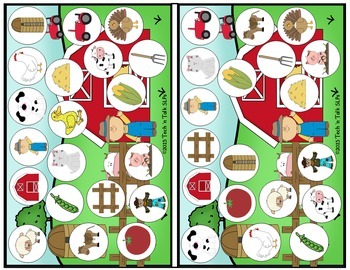 •	Prepositions – Have the students show the farmer in each position described. •	Prepositions – Have the students state the position of the farmer. •	Colors – Have the students find the colors as you name them. 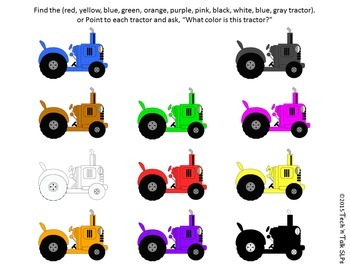 •	Colors - Have students label the color of each tractor. •	Temporal Relations – Have the students demonstrate comprehension of the concepts first, last, before and after. •	Opposites – Have the students demonstrate comprehension of opposites (clean/dirty, tall/short, fat/thin, top/bottom, big/little, inside/outside). •	Opposites – Have the students use the correct opposite word to describe each picture. •	Shapes and Animals – Have the students demonstrate comprehension of shapes by showing the shape on request. •	Shapes and Animals – Have the students label shapes.